JUN AQUINO: a painter and computer graphic artist ,has been the art director of the philippine free press Magz since 1987. FREELY ABRIGO:The maker of "kulas" that came out in manila bulliten.he also created GA & GO that appreared in the mwahahah humor magz. RENE ARANDA: At present, he is the Chief Editorial Cartoonist of the Philippine Star.CHONG ARDIVILLA: He works as graphic designer at the Philippine Star where his comic strip "fringe benefits cafe" appear.ARIEL ATIENZA: His current work is seen in the US San francisco,California weekly prayer,Philippine news.he's also the founding memebers of Artists Den and SAPAK.ROMY BUEN: At present he's the sole editorial cartoonist of Abante and Abante tonite.SHERRY BAET: the first filipina cartoonist to self publish her book.She is known for her work"carpool" which appered in Manila Bulletin for a year.AILEEN CASIS: A woman with so much talent.She does the front page layout of the Manila Bulletin and illustrations for Life and Leisure section.STANLEY CHI: he is the hand behind "chopsticks" for the manila Bulletin.His other works include "biblebloopers" for Christian today; Lucky and Johnny Together with Monkey Business for Biznews.DENNIS COLLANTES: the cartoonist behind Cels talk (manila bulletin).WILLIAM CONTRERAS: he's behind the manila Bulletin's comic strip "tok & mol" and "geno". NEIL DOLORICON:he became the dean of fine arts at UP.MANNY FRANCISCO: The man behind "life's a....."of manila Times.Among his works are "grinminded" and "dog fud".NORMAN ISAAC:of Manila Bulletin.a multi awarded cartoonist here and abroad.Aside fro meditorial cartooning, he does sports cartoon and he's the man behind "norman's island".BAYANI JOSE: at present he's the design consultant at the Department of Agrarian Reform. HAZEL MANZANO:She created "callwork".First published in her company's quarterly magz now relishes a national exposure at manila Bulletin.DENGCOY MIEL: a celebrated editorial cartoonist of strait Times of Singapore.TATUM MILAMBILING: the man behind "three plus three","furry tale", and "idiosyn-crazies" and "tuldok".TITO MILAMBILING: editorial cartoonist of Balita and the hand behind "Kusyo and Buyok of manila bulletin.ED PADILLA: Known as Architect Ed, is currently maintaining his full-staffed office designing buildings and quality establishments. he has a comic book titled, MANG ED.NICK PERTIERRA:Since 1992, when he joined MALAYA,Nick has been holding fort as its editorial cartoonist.MIMI ROMUALDEZ:A college student and cartoonist in one. Her work frog Pond appears in manila Bulletin comic page.ROGER SANCHEZ: A painter and illustrator and was an editorial cartoonist for Manila Standardin 2003. RONI SANTIAGO: He's best known for his work "baltic and Company of manila Bulletin.PAOLO SIMBULAN: A project Architect with the gruppo armani. he;s one of the new and young officers of SKP.JOMIKE TEJIDO:Also known as "kuya Jomike" hosts Art Skool, a children's art show in tv.He created the environmental comic strip, Mikrokosmos for the Philippine daily Inquirer.He's also a multi awarde book illustrator.BOY TAN TOGONON (deceased): Known as BOYTOGS started his career in 1971 when he joined Daily Express. he created "melody" and "sarhentong".BLADIMER USI: a Philippine college of criminology graduate ,also had a stint with the manila times and metro News.JULIUS VILLANUEVA: His work 'life in progress", appreaded at manila Bulletin at the end of 2003. 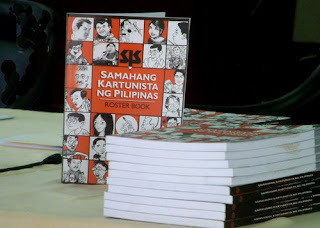 Currently working for a tv show in a major network and preparing for the 2nd life in progress book.ANDREW VILLAR: he is the artist and writer for the 'ambush" comic appears in manila Bulliten.ARVIE VILLENA: as a freelancer, he's done editorial cartoons and poster designs for the Freedom From Debt Coalition.He works right now for golfro international as comgen artist.TOTO YONZON: at present he's working for the tagaytay based company Yonzon Associates run by current SKP President and of Mango Comics that produces MooMoo hunters ,mwahaha and Mango jam.TONTON YOUNG:He's based overseas.KNown for his work "pupung" whose jokes about obesity, baldness and such may not find appreciation in the politially correct environment of USA.BOBOY YONZON: a man jampacked with a lots of talent (nakuha ata nito lahat nung magsabog ng mga biyaya si GOD) Hay--pano ko ba ikaw e describe? ganito na lang kaya: an educator, cartoonist, master of light photographer,writer, director,painter and a LOT MORE! He's a very GOOD friend and presently the president of SKP.To read more about these artists--please buy the book.Let's support the SKP!Most of the artists description were taken from the book itself.